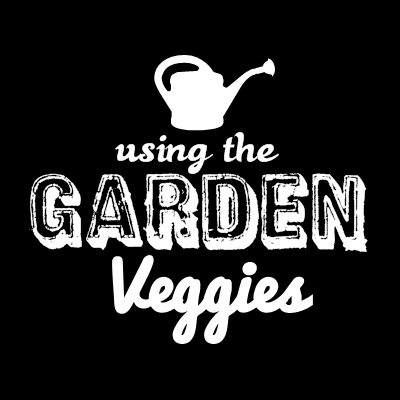 When you have fresh tomatoes and basil from your garden and an eggplant in your refrigerator there are so many delicious possibilities. Basil is perhaps one of my favorite fresh herbs to cook with. 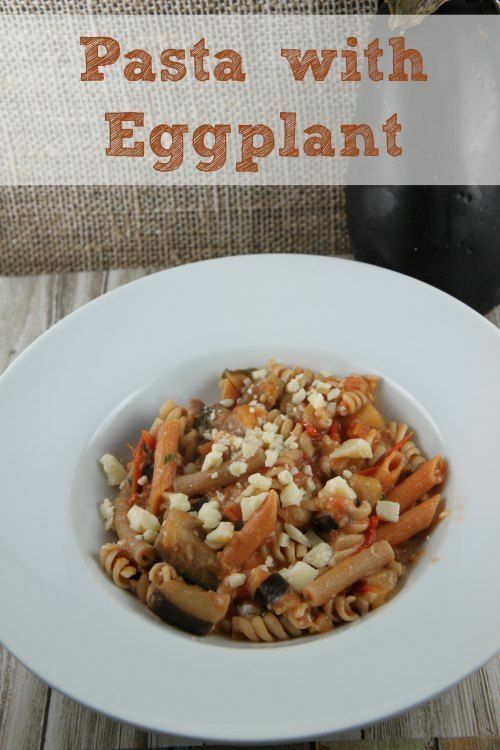 I have used it to make a delicious Margherita Pasta in the past but wanted to try something new and add in eggplant for a wonderful meat substitute so I came up with this easy Eggplant Pasta recipe. The man in the house always says, this is great but it would be better with….MEAT. If you are a carnivore, you could easily add sausage or chicken to this meal to make it a little more protein packed. I think it is delicious and filling without that extra meat in it. 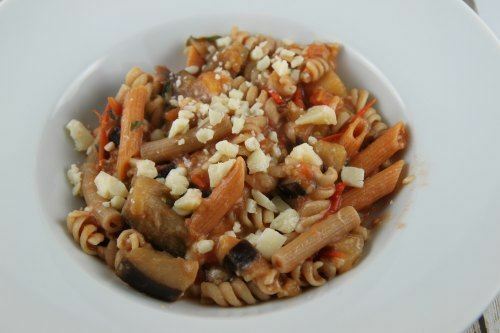 On hand, I also had a little bit of some different pastas including rotini, rigatoni, a vegetable ziti. Why not use all the leftovers for this meal. This is called utilizing what you have in the pantry folks! 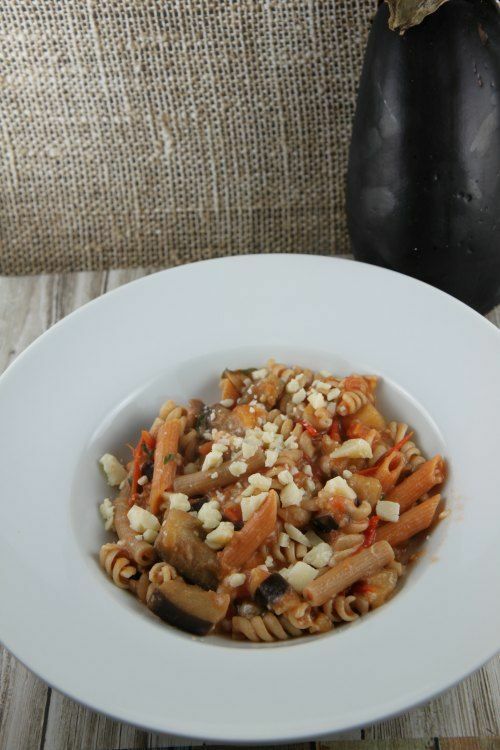 Just use whatever you have on hand or your favorite pasta. First you will want to dice your eggplant. Leave the peel on there. Sprinkle with a little salt to draw the moisture out for about 15 minutes or so. This is a good time to cook your pasta and diced your tomatoes. Warm up your olive oil over medium heat. Add the minced garlic. Cook for about a minute. Then add the eggplant. 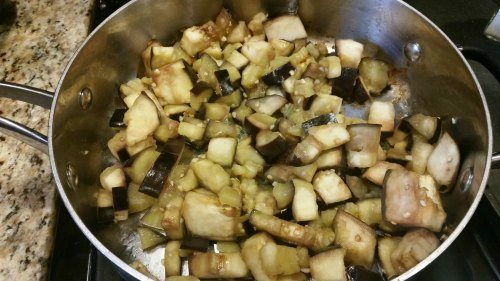 Cook eggplant for about 7-9 minutes or until it softens. 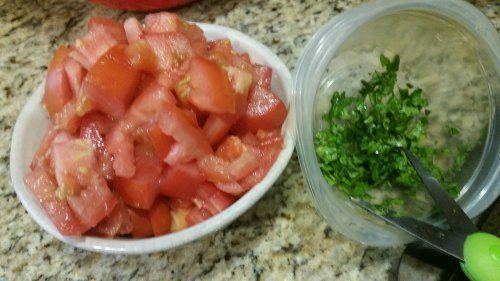 Add tomatoes and about a half a cup of water. Bring to a boil. Then reduce heat and simmer for about 15 minutes. During the last few minutes of cooking, add your fresh basil. Stir in the cooked pasta. Cut eggplant into circles. Sprinkle with salt. Let set about 10-15 minutes to draw out extra moisture. Add garlic. Cook for about one minute. Add eggplant. Cook for an additional 7-9 minutes. Add water and tomatoes and bring to a boil. Reduce heat and cook for an additional 10 - 15 minutes. Add basil during last couple minutes of cooking. 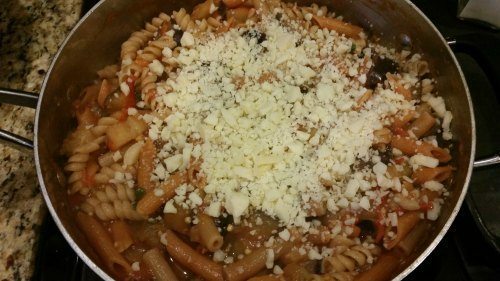 Add cooked pasta and top with parmesan.